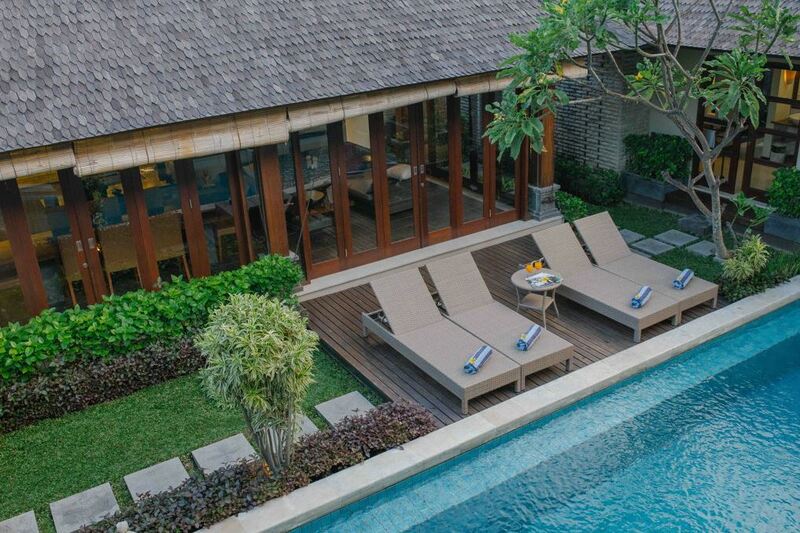 Tis Villas Seminyak feature a contemporary Balinese-style villa with open plan living and dining areas, overlooking its private pool which allowing you to enjoy the soothing breeze against the tropical heat of Bali. 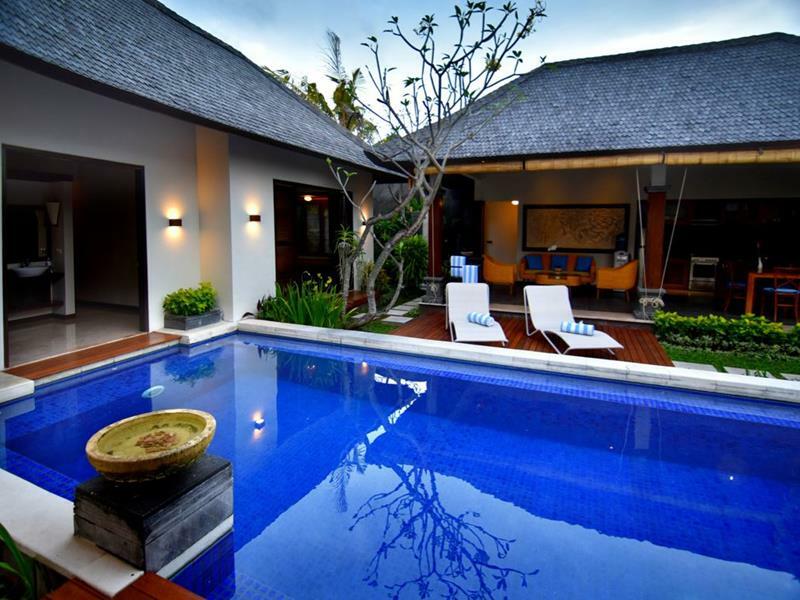 Tis Villa Seminyak comprises of Two 2-bedroom and One 3-bedroom villas. The 2-bedroom villas, which are designed with 2 pavillions surrounded a private pool and tropical garden, features spacious bedrooms and en-suite bathrooms. 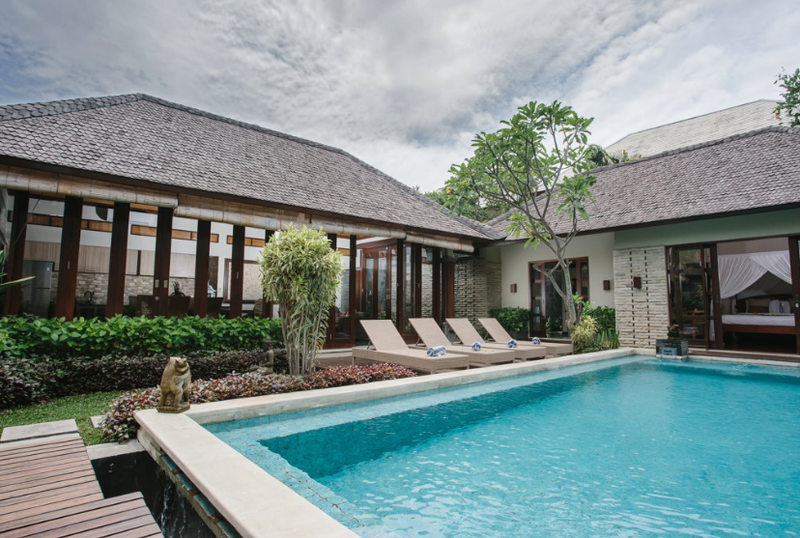 The 3-bedroom villa has an outdoor gazebo, sunbath chair to lay-back and enjoy chilling breeze, and spacious tropical garden. Living rooms are fully furnished with contemporary sofas and chairs, a plasma TV and DVD player. 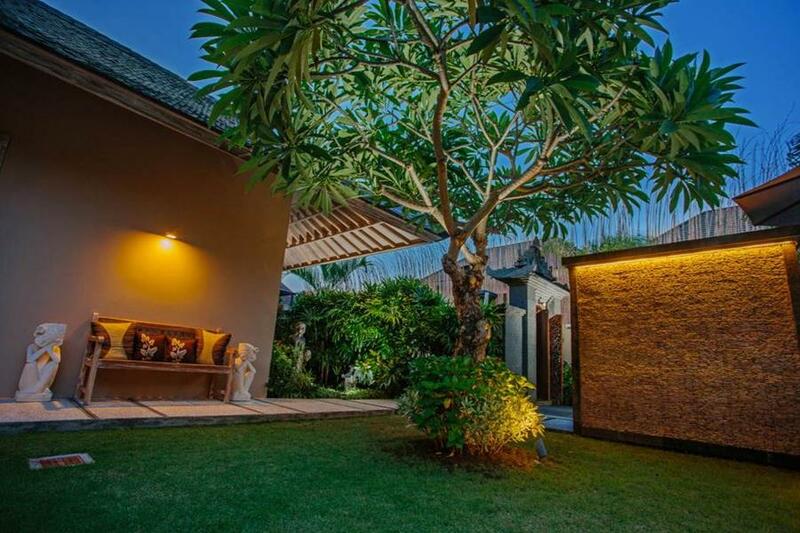 Situated just a short 10-minute stroll from Seminyak Beach, 5 minutes from popular dining & nightlife options such as The Living Room, Potato Head Restaurant and Hu’u Bar. features 2 bedrooms and a gazebo in the green garden, complete with the swimming pool in the middle; fully equipped kitchen, living and dining area. Enjoy the green garden and pamper yourself with the room facilities such as Air Conditioning, DVD player, International TV Channel, comfortable bathroom with bathtub. 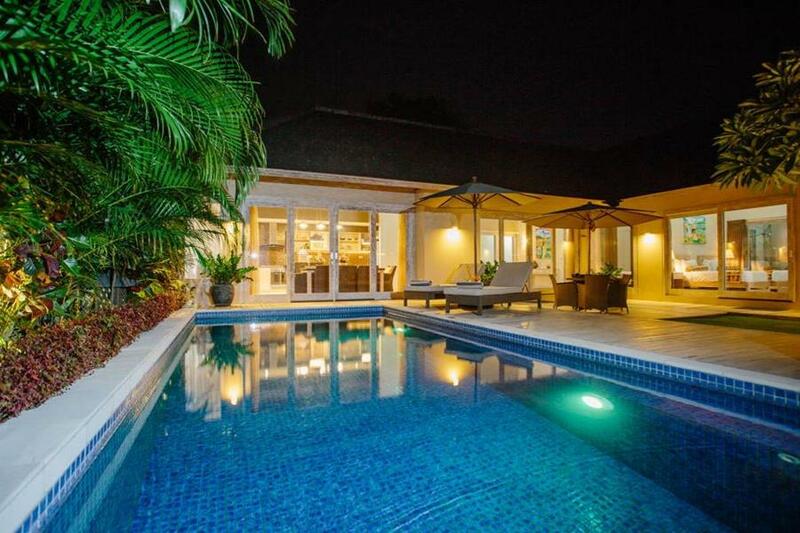 This 2 bedroom villa is composed of two pavilions and a garden gazebo surrounding the swimming pool in the middle. 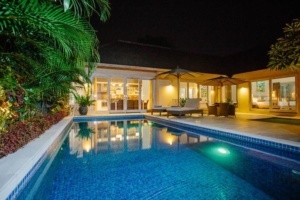 Complete with the fully equipped kitchen overlooking lawn across the swimming pool, the living and dining areas is also surrounded by tropical garden. TV with international channels and DVD player are also available. This spacious 3-bedroom villa has four beds, a garden and an outdoor gazebo to lay-back and enjoy chilling breeze. The fully equipped kitchen comes with cooking facilities, tea/coffee maker and a fridge. A flat-screen TV with international channels and DVD player included. Private bathrooms come with an oversized tub. Please fill the Enquiry Form to receive immediately an e-mail from our operators with all the availabilities details and the instructions for the booking procedure. We can create a space for your property providing all necessary description and high resolution photos. We will work together with you on marketing your property creating tailored ads and using the optimum advertising skills to ensure your properties occupancy is kept at a high level. The advantages are: No lock-in contract No fees Updates calendars Work with you on marketing your Property Feature your Property on our website and on our worldwide network Weekly Updates on the biggest social media platforms Listing on the biggest Holiday search engines Hold the available dates for you needs. Do you want to list your property with us? Book an appointment now. The Certificate of Excellence is given annually to those properties that provide consistently outstanding experiences and whose owners offer first-class customer service to their guests. “We are very pleased to earn Certificate of Excellence for our properties we have listed with TripAdvisor Rentals and we always strive to provide great customer service. It’s great to be rewarded by TripAdvisor Rentals after all of our hard work and it’s wonderful to know that our many guests over the last year have really valued their stay.” The Certificate of Excellence recognises properties that meet strict criteria, which take into account customer service as well as quantity and quality of reviews. More than 230 accommodation available for your Short and medium term stay with a great range of Apartment, Villas, B&B. We purposely avoided reservations online, because it is a pleasure to assist you personally. For us, the human touch is fundamental! Our team respond to your requests efficiently, effectively, with care and attention to detail in less than 30 mins depending on your time zone. Copyright © 2015–2019 - Unica Property Management Group is not responsible for content of external sites linked to this one. All Rights Reserved.